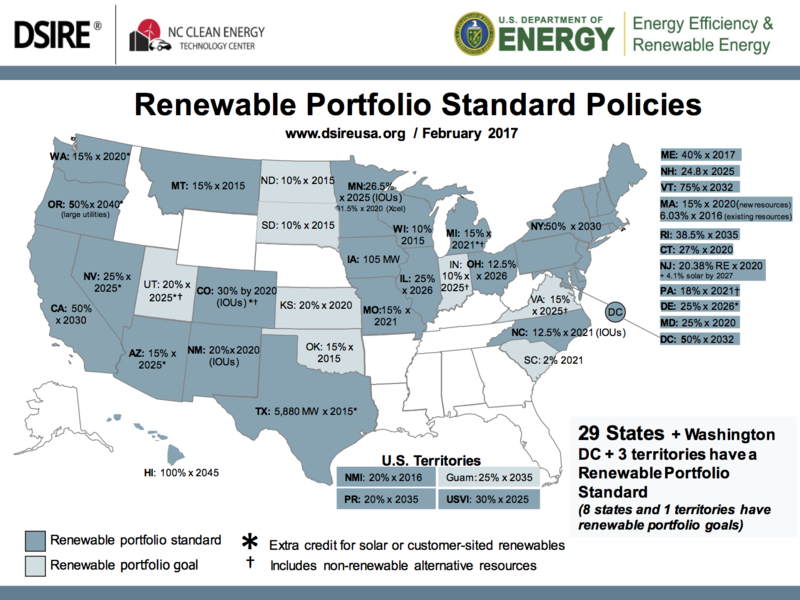 This map shows which states have renewable portfolio standards. Well-meaning companies and buildings continue to purchase RECs generated from surplus wind in places like Texas. What makes it “surplus” wind? Like many states, Texas has a minimum requirement for renewable energy generation called a renewable portfolio standard (RPS), which “retires” RECs needed to meet the state requirement. But because the economic attractiveness of wind in Texas is so good, the state has already exceeded its RPS, and the resulting supply has led to glut of excess RECs. Meanwhile, buyers continue to buy them because they believe them to be driving new renewables to be built, which is far from the case. Or they’ve purchased RECs from places like Wyoming, which has no RPS at all, and where, as in Texas, wind is built because it’s windy, not because of the additional incentive of the REC. Other entities, such as the City of Aspen, have secured bundled renewable energy contracts (where the REC and the electricity are sold together) via a wind farm in Kimball, Nebraska, but Nebraska also has no RPS, and it is therefore likely that this wind resource would have been built anyway to benefit the local Nebraska grid instead of being exported to Aspen (see here for a map of states with RPSes). What is needed is a mechanism to purchase renewable energy for a new development (we’ll get to existing buildings in a minute) that clearly promotes adding new renewable energy to the grid. That means developing new, local, off-site renewables that function almost as if they were being placed onsite. This is already recognized by the International Living Future Institute (ILFI) and Architecture 2030 in their NZE and NZC definitions, respectively (including this ILFI NZC update that came out as recently as last week). But this in turn requires policy mechanisms at the state and utility level to enable connecting the off-site generation to the onsite load. Currently, there are a few such mechanisms in select states, including remote-net-metering in New York (which is migrating to a “Value of Distributed Energy Resource” or VDER tariff) and Community Solar Gardens (CSGs) in Colorado. Neither of these is a perfect solution. [i] Still, these are far better options than REC purchasing, and the building industry should be advocating for these policies and those that improve upon them. It is naïve and somewhat irresponsible to promote getting to zero without the ability to procure 100% of a project’s energy through new, local, off-site renewables. The U.S. Green Building Council, the New Buildings Institute, ILFI, Architecture 2030, and other entities that represent the sustainable building industry should advocate for a clear set of policy options to enable this. One solution would be like a dynamic time-of-use (TOU) electricity rates we are already used to: we pay more when demand is higher. But this version would take a building's energy supply (including off-site supply) as well as its energy demand into account. Here, the TOU rate would be applied to the net difference between what the building supplies to the grid and what it takes from the grid, and the rate could shift from month to month, day to day, or even in real time. A grid balancing and integration charge would also be necessary—because we will always need the grid, and we need to come up with a way to pay for it, even when the utility isn’t playing the role of the renewable energy provider. This is how it would work: On an early summer afternoon (i.e. at peak grid usage times), TOU rates would be high, and a building that is producing more than it is using would be credited at a higher rate. However, as more solar comes online and the grid peak is pushed back to the early evening (see the duck curve conundrum), when the solar is no longer producing, then the building would be credited less for its solar production in the middle of the day and charged more for its consumption in the late afternoon. This would in turn incentivize the deployment of battery storage to take advantage of the more lucrative rates, and start turning buildings into actual utility resources, rather than just proud, one-off, exemplary sustainability projects. Ultimately, we need a dialogue with the utility so that we add renewables in a way that supports their broader goal of decarbonizing their grids (e.g., California and New York are targeting 50% renewables by 2030, Oregon is targeting 50% by 2040, Vermont: 75% by 2032, and Hawaii: 100% by 2045). We need the utility to tell us when exporting renewables onto the grid is helpful and when it isn’t—in the form of rates that incentivize production and consumption at the right times. Once that’s clear, we will be able to use energy storage and demand response to shape our load profiles to support overall grid health and resilience. Otherwise, buildings are just guessing and hoping they are being helpful. Programs like those discussed above that address new load would need to be additional to existing utility plans to add renewables for their current grid mix. That would create the scenario where new development would need to procure renewable energy rights[ii] (i.e., demonstrate a contract for new renewables within a given local grid), the same way a development would need to procure water rights in dry states, or obtain a building permit. You want to build new? You need to procure your renewable-energy supply. This could also be triggered by major renovation projects, the addition of electric-vehicle charging to existing buildings, or anything that could clearly be denoted as “new” load. Existing buildings should be also be allowed to participate in the same types of programs, as long as the renewables associated with this participation is additional to the utilities’ larger decarbonization plans. Currently, solar installed by existing customers or through a community solar garden is generally considered part of a utility’s larger renewables goal or RPS requirement, not in addition to, which confuses the impact of that solar installation. So, should new development projects pursue NZE or NZC? Yes! They should not only adopt it as a goal but also should be required to achieve this—especially for any third-party certification—if the policy mechanisms exist in a given location to procure 100% of their renewable energy from additional, local sources. Next Time: A better definition of NZC. [i] Remote Net Metering ignores that value the grid plays in both transporting the energy, and the initiative to create VDER tarrifs are intended to address this; Community Solar Gardens function through a series of credits provided to the buyer that generally outweigh the costs, but don’t respond to any grid signals regarding time of use. CSGs are also likely part of a utility’s RPS approach, meaning that if the CSG wasn’t built, then the utility would have to go forward with some other renewable energy installation, so from the building’s perspective the CSG isn’t really additional to what would have happened anyway. [ii] And keep and retire the associated RECs.